Fay F. McKonly — Workman Funeral Homes, Inc.
Fay F. McKonly, 92, of West Hempfield Township, passed away on Monday, June 25, 2018 at home. She was the wife of John H. McKonly to whom she was married for 53 years before he passed away on September 7, 2003. She was born in West Hempfield Twp., daughter of the late Daniel H. and Esther Seitz Fisher. She was employed by Hamilton Watch Co. and Mountville Wallpaper Factory as a secretary. She also worked as a bookkeeper for John H. McKonly’s Garage. 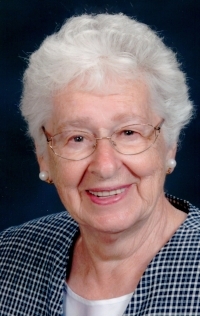 Fay was a graduate of East Hempfield High School, Class of 1943 and a Charter member of Hempfield United Methodist Church, where she taught Sunday School for many years and faithfully attended worship. Fay enjoyed traveling, gardening, and feeding her family. She extended a standing invitation for Thursday night chicken dinner to anyone who wanted to come, and continued with her husband John’s tradition of taking the family to breakfast every Saturday at the Silver Spring Family Restaurant. She said her hobby was going for groceries, shopping at several stores, and Roots Market weekly for their specials. Fay had a wonderful wit, enjoyed her family, and loved keeping up with her daughters’ and grandchildren’s interests. She kept active with aqua aerobics and gentle yoga. She enjoyed living in the home that she and John built in 1951 on land given by her parents. She especially liked planting flowers, shrubs and trees. She is survived by five daughters: Melinda L. McKonly, Manheim; Cynthia (Thomas) Kahler, Columbia; Judith (Bruce) Freidly, Manheim; Kathleen (Christine Macready) Brown, West Hempfield Twp. ; and Kimberly (John) Cooper, Plymouth Meeting. Three grandchildren: Erin Farmer, Jonathan Kahler, and Jessica Freidly. Four great-grandchildren: Maeve Kahler, Lucy Kahler, Dylan Kahler, and Hannah Farmer. Five siblings: Joyce (Leonard) Droege; Margaret (John) Brown; Jacqulyn McKonly; Jennifer (James) Meley; and Holly (Joseph) Mele. She was preceded in death by one grandson: Colin T. Kahler, and six siblings: June Fisher; Daniel H. Fisher, III; Mary Kauffman; James Fisher; Eugene Fisher; and Janice Metzger. The Funeral Service will be held at Hempfield United Methodist Church, 3050 Marietta Avenue, Lancaster, PA on Friday, June 29, 2018 at 11:00 A.M. Interment in Silver Spring Cemetery. Friends may call at the church from 9:00 A.M. to 11:00 A.M. In lieu of flowers, memorial contributions may be made in her memory to: Power Packs Project, 1006 New Holland Ave., Lancaster, PA 17601 (www.powerpacksproject.org). Arrangements by the Workman Funeral Homes, Inc., Mountville/Columbia. To send an online condolence, visit the condolence page.